So I realize I’ve only been a mom for a little over a month now, and by no means claim to know what I’m doing (seriously…help me), but here are just a few things I’ve used this last month that have been so helpful. Of course you need a carseat, diapers, a stroller, and other essentials like that, but I’m talking beyond that. A baby wearing wrap of some sort: I use this Baby K’tan wrap. And while I like it, it’s easy to put on, and it works great, I am eager to try out some other ones.Do you have a favorite? If you don’t want to do the whole wrap thing then might I suggest this baby wearing SHIRT by Lalabu. I seriously love this tank. I was so surprised by how strong and supportive it is for a simple tank, but it really packs that baby in there nice and tight. When the baby isn’t in it it just looks like a nice tank top. “The stylish Soothe Shirt can become part of your everyday wardrobe by assisting you with the easy-to-use nursing bra. It features two fabric layers for extra coverage and a soft elastic band for support.” Win win. I think I’m going to have to go back and buy the purple one next. 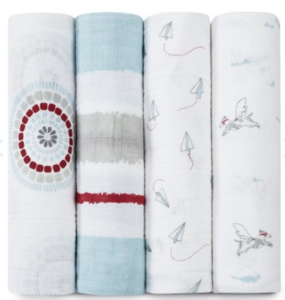 Swaddle blanket– Babies love to be swaddled. I can’t tell you how many times Griffin would be upset, and we’d wrap him up all nice and night in a swaddled and he would quickly be content. “First, it keeps your baby’s arms tight to their sides, which prevents the startle reflex from waking them. Second, it mimics the feeling of being snuggled tightly in the womb, which helps your newborn feel comforted and calm. And finally, it keeps your baby warm without any dangerously loose blankets, which can be a suffocation hazard.” Source– also gives a list of their favorite swaddles. 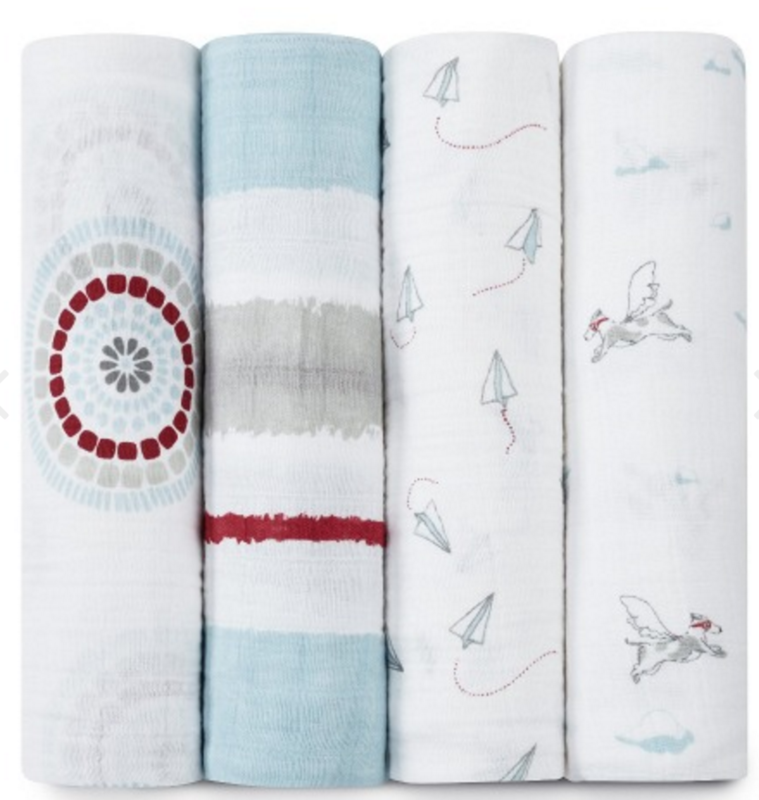 We like the Aiden and Anias swaddles. They’re big and light and breathable, but require you to do all the folding and tucking yourself. If that intimidates you, then try this Zen Swaddle. It’s easy to use with velcro, and is lightly weighted in the center to simulate the way it feels when you lay your hand on your baby to soothe him/her. 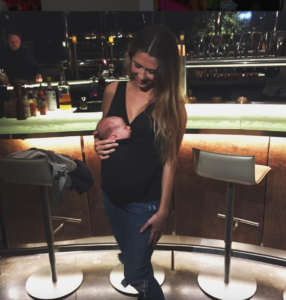 Milkies Milk Saver– Did I mention you pretty much breastfeed all day everyday? Well, did I also mention that as you feed on one side, this crazy thing happens where you leak out the other side! It’s like, baby latches and the floodgates open on the other side. Goodbye liquid gold. Cue, 100 soaking wet shirts everyday. Cue, way more laundry than you have the energy to do. But never fear, the Milkies Milk Saver is here! This thing is so cool. 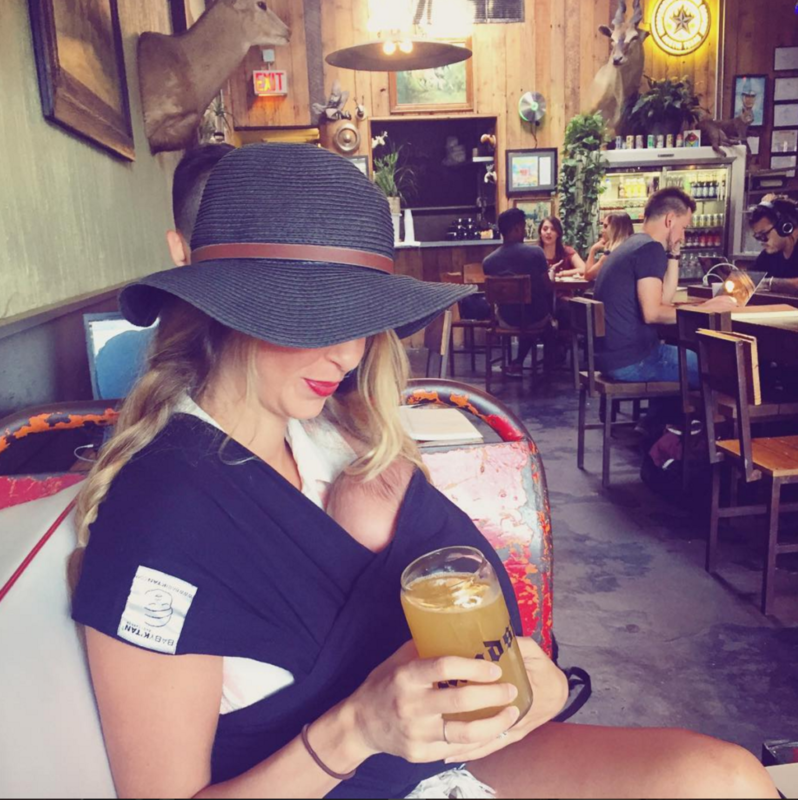 “The patented Milk-Saver collects your leaking breast milk as you nurse or pump – allowing you to store extra breast milk effortlessly with each feeding.” Heck, even if you don’t save any of the milk, it keeps your shirt from getting leaked all over! That’s mainly what I use it for. Hallelujah for dry shirts. Nursing cover– since we’re talking about feeding your sweet babe 100 times a day, you’ll probably want a nursing cover if you want to go out into the world. These Milk Snob covers are my favorite! First of all, they act as carseat cover so if your baby is sleeping you con put it over the carseat and you won’t have everyone and their mother reaching in trying to touch him….well ok, there may still be some people. Secondly, it’s a super soft and stylish cover that just slips over your head around your whole body. It’s light weight so it doesn’t get too hot in there for the baby, and because it’s thin it lets some light in so it’s not too dark in there. E-Reader– Now obviously you don’t have to have this, but it sure will make those long feeding sessions go by much easier. Have you tried feeding a baby in one hand, and reading a phsical book with the other? Keeping the book open and turning the pages become a new olympic sport. Ok, it’s not that hard but it is super annoying, whereas having a nifty e-reader such as an iPad or Kindle with the simple one finger swipe to turn the page, really is nice. Some people opt to use this time to watch tv shows, but with as much feeding as you do, I think my mind would turn to mush. “Padsicles”– It’s a thing. A thing you make actually. Let’s just say after you push that baby out, you’re hootchy-hootch isn’t going to feel so great, thus the soothing icy glory that is the padsicle. You get a little witch hazel, a little aloe vera, put the pad in the freezer, and boom, instant (momentary) relief. Google it. You’ll thank me. Meal Train– Make people bring you food!! Just do it. Heck you just had a freaking baby, this is your time! Milk it. Hopefully you have a friend or family member who will set up some sort of meal train for you where people can sign up to bring you meals (I don’t care if you’re Martha Stewart, you won’t want to cook). If said people don’t think of this right off the back, gently nudge them in the right direction. No shame. You just had a baby remember. People want to serve you, so let them. Our first date night 10 days after Griffin was born. 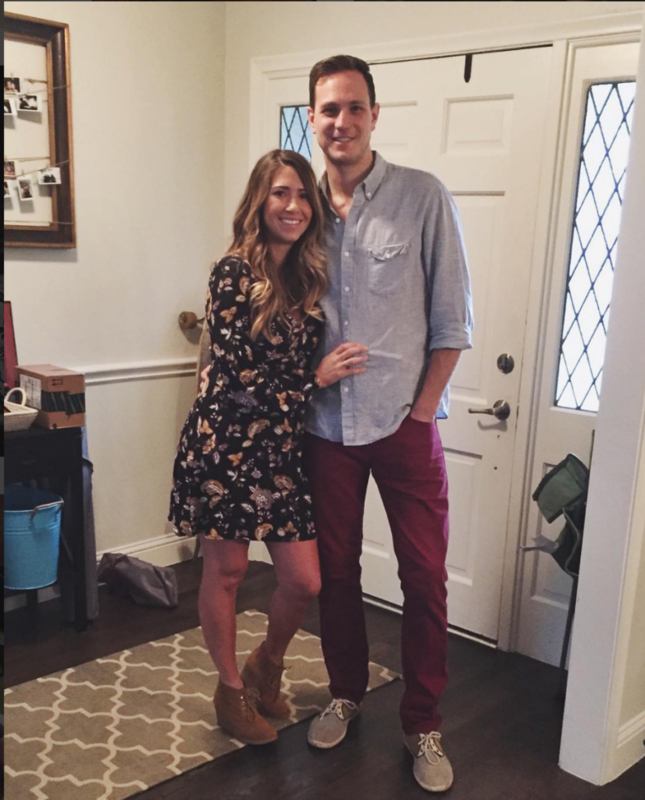 Date night!– Do it. Sans baby. You need this. You deserve this. Promise me that sometime in the first month you and your partner will go out on a real one-on-one date, put on clothes, brush your hair, the works. Grab a trusted friend or grandparent to babysit (I’m sure they’re all chomping at the bit for some baby time anyways). Plan it around a nap time. Feed your little one right before so they snooze the whole time, then quickly run out the door with your man for an hour (or two if you’re feeling crazy). To be honest you two will more than likely just talk about and stare at pictures of your little one the whole time but that’s ok. 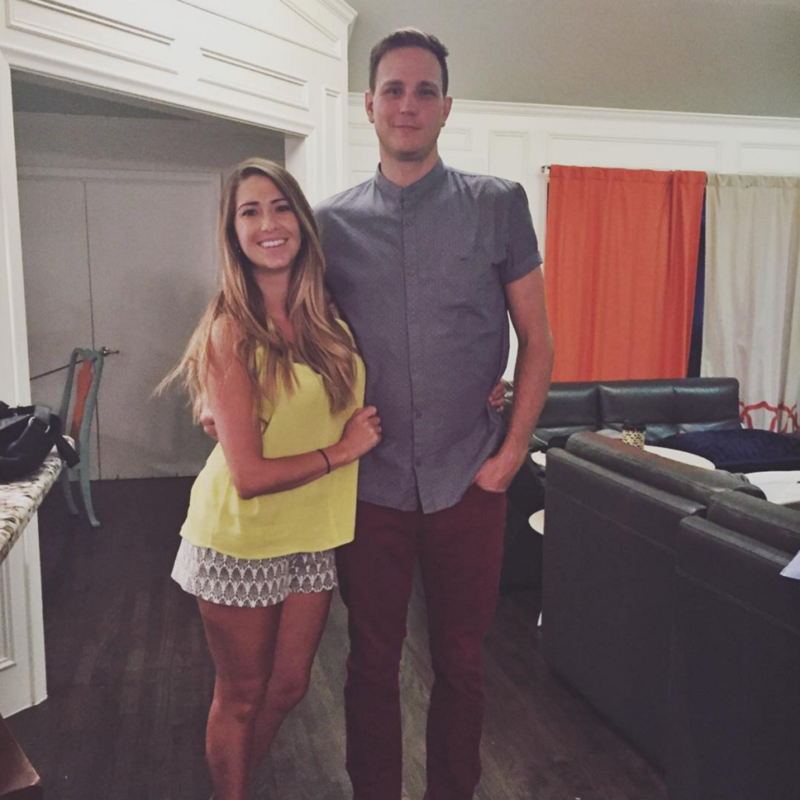 Remember, as hard as it is at this point, your relationship with your spouse should still come first. So there you have it, my top ten new mama things. What is something you would add to this list? 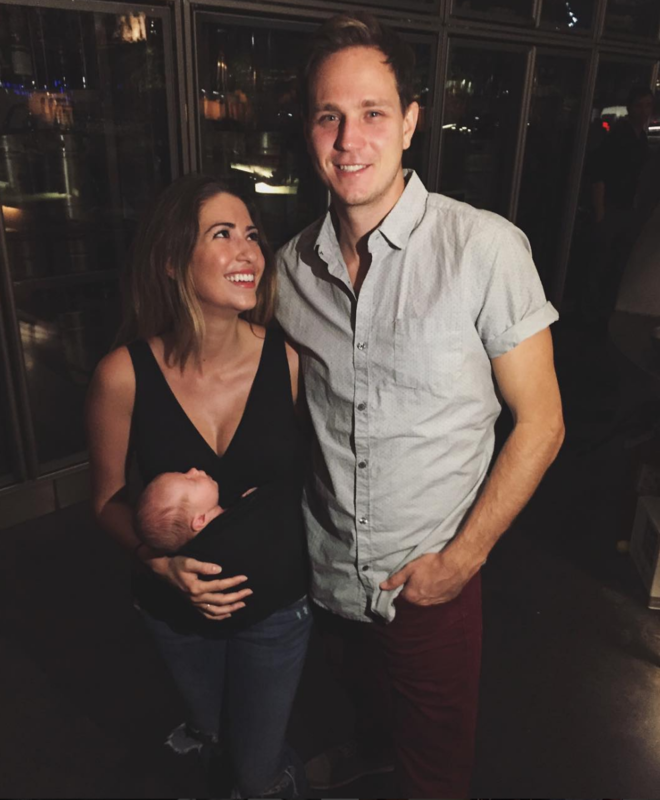 What things did you find to be helpful in the first couple months of having a new baby? Thank you for this post. 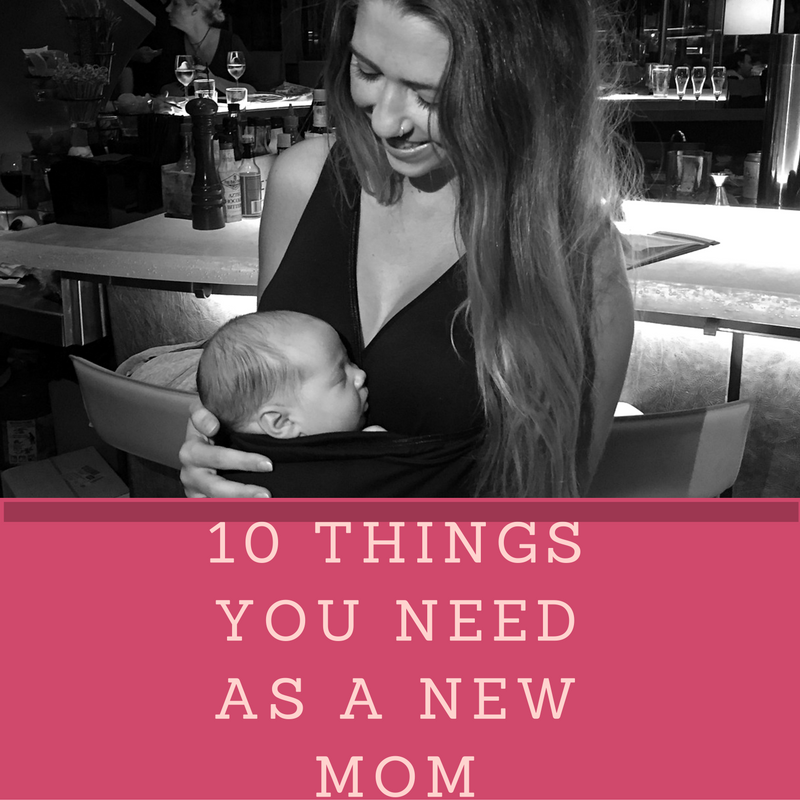 So helpful to new mamas! You’re so welcome love. You’re going to make the best mama!